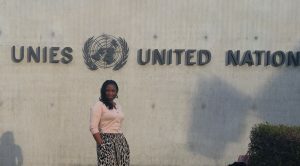 The inquiry abuse of black Briton was among the issues raised in a position paper that human rights campaigns group Black Mental Health UK (BMH UK) presented to members of the 18th session of the United Nations Working Group of Experts on people of African Descent (WGPAD), at the Palais de Nations in Switzerland. Entitled: ‘State Violence Against People of African Descent in the UK‘, this six page document raised a number of human rights concerns over the treatment often experienced by black people from the UK’s African Caribbean communities, with a particular focus on those detained under the Mental Health Act. The paper brought the human rights concerns over the use Taser against people black people detained on locked psychiatric wards to the attention of delegates attending this forum. A section in this brief also focused on the disturbing practice of specialist riot TSG (Territorial Support Group) police being called to hospitals to deal with patients who are distressed, or viewed as difficult or dangerous by staff. This document brought to the UN Working Groups attention the issue of the widespread inquiry fatigue among black Briton’s in the wake of the litany of national reviews and inquiries that have been ordered that never lead to change. This document explained that in the UK, the State’s standard response to many of the injustices and inequalities that black Britons have faced over the past 30 years or more has been to order a national inquiry or review. This position paper showed how this practice generates widespread media coverage but has never led to any substantive change or justice for black Britons. BMH UK’s position paper also showed that the power dynamic in these processes has meant that black Britons are constantly called to provide unpaid expertise, while this activity has proved lucrative for those, not from this community, involved in this work. Not one of the inquiries we have seen over the past has resulted in justice for black Britons. The consistent failure of such reviews to lead to systems-wide policy changes is a form of abuse and also form of state violence, this paper states. Matilda MacAttram director of BMH UK and Fellow of the UNWGPAD said: ‘State violence works of many levels and this position paper that was presented at the 18th Session of the United Nations Working Group on People of African Descent, showed how black Britons are subject to state violence both as individuals and as a community. ‘The UN were not aware that Taser guns are being used against patients in hospital until we presented our position paper to them. Taser guns are a firearm and as such, BMH UK are of the view that they have no place in a clinical setting. This entry was posted in Lifestyle & Health and tagged State violence against black Britons presented to the United Nations, black mental health in the UK. Bookmark the permalink.